Apple has added a new app for musicians who want to capture ideas on the run, and updated Garage Band for iOS with live loops. 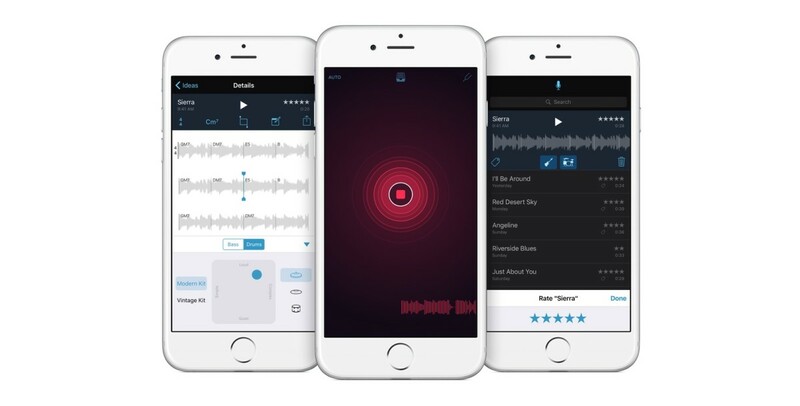 Music Memos, Apple’s newest app, is essentially like a note taking app for musicians. It lets you capture and arrange snippets, and analyzes chords and rhythm for acoustic guitar and piano sessions. Once it analyzes rhythm and chords, the app offers to add a drum beat or bass for a better idea of what the finished product may sound like. That ‘virtual band’ can also be customized to suit your needs. Using the iPhone’s microphone, sound files are captured and saved without compression. After you save a file, you can tag, name and rate it. It syncs with iCloud, and can be opened in Garage Band or Logic Pro X.
Garage Band for iOS also has Music Memos’ drummer feature with nine EDM and acoustic sessions to choose from. The app has an expanded library of amps for bass players, controls recording and a new EQ. The new live loops feature is handy for DJs, and lets you tap cells on-screen to add an instrumental loop. Those loops can also be rearranged and mixed live, and the cells interface is completely customizable. Garage Band also keeps beats in sync with time and pitch. Music Memos is available for free on the App Store, and is compatible with iPhone 4S and newer, or iPad 2 and later.